Base sitting platform size 1600mm dia; height of back support : 900mm; bottom dia. of the base : 1122mm; top dia. 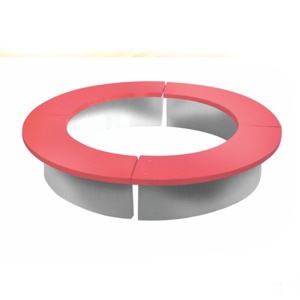 of the base : 660mm; thickness of bench : 50mm. Manufactured by using M-30 grade of concrete using vibro compaction process. Reinforced suitably to promote long use and to prevent damage during hadling, transportation Er erection. Bench top is treated with special anti-corrosive, water proof coating so as to make surfaces glossy and water proof or Terrazzo finish.